Alastair Chalmers took the headlines following a stunning performance at the Intertrust Athletics Games on Saturday afternoon. And whilst his brother Cameron missed the 400m all-comers’ record by a mere 0.03sec, Ala’s was one of seven records to fall on a glorious afternoon which also saw a couple of other record-near-misses by visiting athletes. The meeting was also notable for some excellent performances by local athletes of all ages who drew on the atmosphere of an event which included teams from England Athletics and Scottish Athletics. The presence of the Scottish Athletics National Academy side meant it was the first time in a decade that a Scottish team had competed at Footes Lane and the sizeable England U20 squad was the first England team to do so. Cameron’s 400m was slightly disappointing in some senses following the pre-meet withdrawal of Theo Campbell due to a hamstring injury and then the same feat struck Sadam Koumi only 50m into the race as he hit the track clutching the back of this leg. This left Chalmers in essentially a two man battle with England’s Alex Haydock-Wilson who ran a solid 47.37 for second place. The winning time of 46.53 fell agonisingly 0.03sec off the all-comers’ record. Similarly both England’s Sam Challis and Eleanor Broome were within touching distance of the respective long jump records…however five all-comers’ records did fall to England U20 athletes. Abby Ward was a hot favourite to take the high jump and duly did so with a leap of 1.81m, comfortably beating a record dating back to 2003. She attempted the World Junior qualification height of 1.84 and twice came agonisingly close to achieving it. Immanuela Aliu clocked a personal best despite a headwind of -1.5 in the 200m – the England junior clocked 24.21 to erase Hannah Lesbirel’s Island record from the all-comers’ list. Her team mate Emma Alderson duly despatched the 400m mark of GB relay regular Kelly Massey in the longer female sprint with an impressive 55.17 on a day when the wind did seem to hamper some of the quarter milers. Both England teams took victory and all-comers’ marks in the 4x100m relays – the women in particular were extremely impressive in doing so with 46.13 being a very high class performance. The final all-comers’ record was a fantastic display of hurdling by guest athlete Georgia Silcox, who overcame the challenge of Anastasia Davies and Pippa Earley of England to record a PB of 13.81 to take victory in the first senior event of the day. Arguably this was the race with the strongest overall depth and it could have been even quicker had there been a breath of tailwind to help the athletes along. 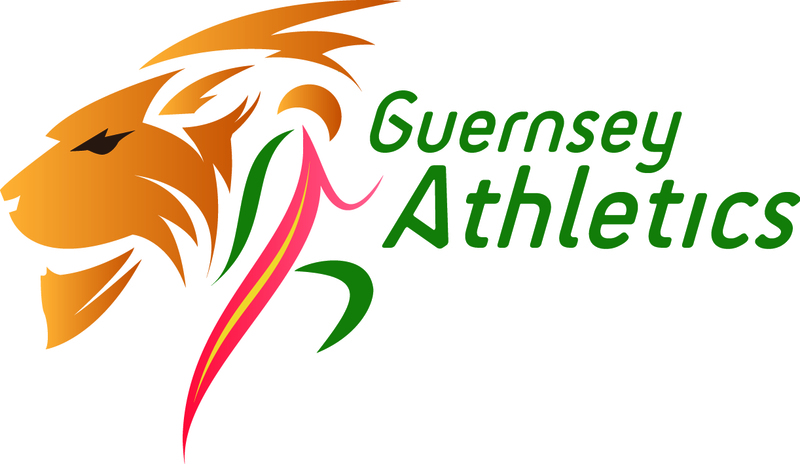 There was a Channel Island victory in the high jump as Ben Le Rougetal took victory on countback with 1.95 in what was probably the closest contest of the day – Lucas Rive and Evan Campbell both cleared 1.90, a huge personal best for the former, who was absolutely delighted. 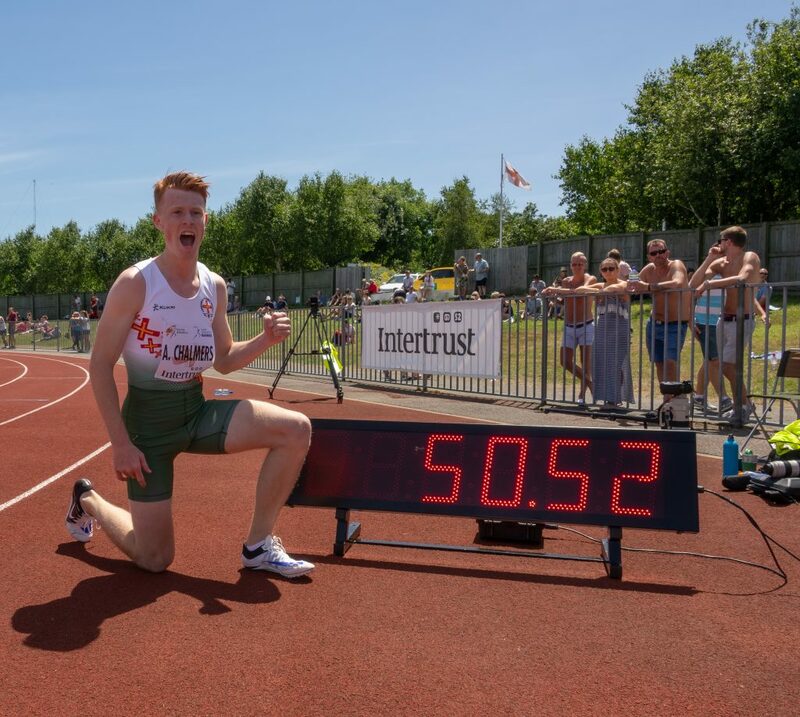 Another extremely close competition was the men’s 100m where a Channel Island winner was denied by less than 0.01 as Josh Allaway was given the same time as England’s Eden Davis with a PB of 10.71 for second place. Scottish pair Fraser Angus and Adam Clayton clocked 10.75 and 10.76 respectively behind Allaway’s outstanding performance. The 800m was a fascinating watch as England named four athletes in the event – and it was a far more intriguing battle for the absence of a pace maker. After a first lap of 58sec, Will Crisp closed in under 52sec to take the victory from his team mates and Island Games Champion representing the Scots, Seumas Mackay. The Guernsey contingent fought well behind and Richard Bartram and Joe Yeaman were both ecstatic, particularly the latter, to run 1:56 for 6th and 7th places. The javelin throwers bemoaned the headwind which continued to slow up their javelins in the air – but it still made for an interesting battle as Greg Millar took victory over Joe Harris and Benji Pearson with 68.49m. The women’s 100m saw guest athlete Katy Wyper upset the England pair of Cassie-Ann Permberton and Amy Hunt to steal the victory from the middle lane. All three women went under 12sec with Wyper’s time of 11.74 less than a couple of tenths of a second outside Montell Douglas’ all-comers’ mark. The 1500m was, like the 800m, more of a tactical affair and was ultimately won by Scot Naomi Lang from local favourite Sarah Mercier. Lang clocked 4:29.05 and looked supreme over the final lap. Mercier has not competed over the distance for a good while and looked impressive in taking second spot ahead of the visiting England U20 women. Local and junior reaction to follow throughout the week. Results are now on Power of 10 available here.